Citation: D. R. Thomas, MD, FRCPC, Department of Dermatology and Skin Science, University of British Columbia, Vancouver, BC, Canada. Topical Treatment for Acne: A Case Study. US National Library of Medicine. 2007. Adult acne or Acne vulgaris is the most common condition treated by physicians across the globe. It is much more common than most people think; affecting about 80% of adolescents and young adults aged 11-30 years . The case presented here is of a young woman, suffering from adult acne with a history of adverse effects to topical treatments, and whose job required her to be in contact with the public. To conceal her acne-affected skin she wore makeup, but her appearance would often embarrass her in her professional and personal life. While she was on medication for long-term acne problem, she confessed being very impatient with the rate of response to treatment. A closer inspection of her skin, after completely removing the make-up revealed the presence of inflamed papules (small pimple or swelling on the skin also known as inflammatory lesions) with some comedones (non-inflammatory lesions) that were located mainly on the cheeks and forehead. While the background skin of her face appeared normal, there were many whiteheads on her skin. Further investigation brought out that her periods were regular and she was not taking any oral contraceptives (which is often prescribed to handle such adult acne). She had a history of eczema and adverse reactions to some topical products. The patient was not taking any medications that could aggravate acne (e.g., lithium, phenytoin). She also confirmed that her makeup was oil-free and formulated so as not to cause blocked pores. 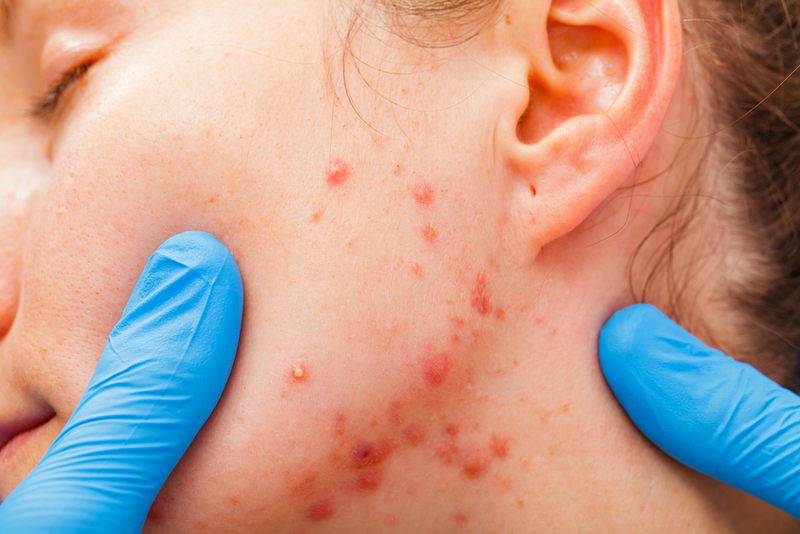 Acne had had a visible psychological impact on the patient, maybe because of the nature of her job or due to prolonged treatment and delayed outcomes. On analyzing her case, experts felt that it was highly unlikely she had retinoid allergy. Retinoids are very commonly used to treat acne, help unclog pores and allow other medicated creams and gels to work better and also reduce acne outbreaks by preventing dead cells from clogging pores. It was found that the patient had a history of adverse reaction to topical treatment, and that her reaction began within 48 hours of using a retinoid product, producing skin redness, scaling, and sensitivity, but no swelling of the eyelids. Because of her past experience, it was difficult for the patient to accept retinoid treatment as an option. Moreover, she wanted to avoid systemic therapy, at least initially, and could not afford laser treatments. So a topical antibiotic-BP combination, to be applied once daily in the evening to decrease inflammation and reduce the number of lesions, was recommended. In all such cases compliance is a big issue due to unsuccessful treatment outcomes in the past. Therefore, while dealing with adult acne a great deal of attention must be paid to ensure that the chances of irritation are minimized. In fact, this may be the single most important factor determining the success of topical therapy in the treatment of adult acne.
. 1. Sangita Ghosh, Soumik Chaudhuri, 1 Vijay Kumar Jain, and Kamal Aggarwal. Profiling and Hormonal Therapy for Acne in Women. Indian Journal of Dermatol. 2014 Mar-Apr; 59(2): 107–115.